All images shot by Sam Rutherford/Gizmodo unless otherwise noted. You did it. You waited out all the announcements back in the spring during Mobile World Congress and the deluge of new handsets that debuted this fall. 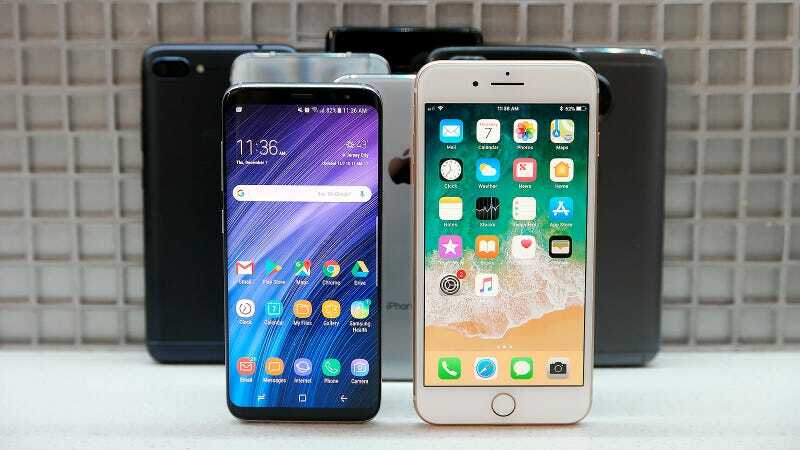 But now, after upstarts such as Essential have had a chance to shine and giants like Apple and Samsung are done plying their latest wares, there’s a big question worth asking: What’s the best phone out right now? Ok, hold up for a sec though, because it’s not quite that simple. Smartphones are highly personal devices, so there’s no one phone that satisfies what everybody wants. So instead of picking one winner, we’ve broken down our picks into a handful of categories to better suit your needs. Starting on the Android side of things, the phone you want is the Galaxy S8 (or S8+, if you like bigger screens). It’s powerful, it’s sleek, it has the best display, and more than any other phone this year, the Galaxy S8 did the bezel-less trend right. You also get the option to try VR by way of Samsung’s Gear VR, solid IP68 water-resistance, and well-rounded 12-megapixel camera with super fast autofocus. And with prices for the S8 currently hovering around $650 (or less), Samsung’s Android isn’t ludicrously expensive either. On the other side of the divide, the iPhone 8 Plus is the sensible, though not super exciting pick. It has the same guts and newly added wireless charging capabilities as the $1,000 iPhone X, and essentially the same dual cameras too. The big differences between the two are the iPhone X’s more compact, bezel-less design, its Samsung-made OLED screen and the 3D facial recognition tech hidden inside the iPhone X’s much maligned notch. That means you won’t get the ability to create floating animated heads that respond to your reactions, but you do still get a handy Touch ID Home button. And let’s be real for a second—while Apple’s fingerprint reader isn’t as futuristic as Face ID, Touch ID is still more secure and less prone to confusion than Apple’s newfangled tech. And with a price that’s $200 less, the cheaper iPhone 8 Plus is the most practical one to get. In a year when high-end smartphone makers have seemingly lost their minds, the OnePlus 5T is a bit of welcome relief. Starting at $500, you get the same Qualcomm 835 chip found in every other flagship Android phone, 6GB of RAM, 64GB of storage, and an all important headphone jack. And if that’s not enough, you can upgrade to a model with 8GB of RAM and 128GB of storage for just $60 more. The OP5T also comes with a big 6-inch extra wide AMOLED display (in a body the same size as the old OP5), super fast facial unlock tech (though it isn’t anywhere near as secure as the iPhone X’s) and a bonus rear cam specifically tuned to improve your low-light photos. The OnePlus 5T isn’t just a solid option for a reasonable price, it might be the best value of any phone released this year. While it might seem a bit counterintuitive, the tightest smartphone competition isn’t for best flagship phone. It’s actually for what’s the best handset under $250. Honor, ZTE, and Nokia all make some pretty fine devices that won’t blow up your wallet, but the real champ is the Moto G5 Plus. For $230, the Moto G5 Plus runs a practically stock version of Android, sports essential features like a built-in fingerprint reader and microSD card expansion, and most importantly, it works on any carrier. On paper, the recently announced Honor 7X comes close, but since it’s limited to GSM networks like AT&T and T-Mobile, the Moto G5 Plus is our pick. Also, if you’re an Amazon Prime member trying to save every last penny, the Moto G5 Plus can be had for just $185. The catch is that you will have to put up with seeing Amazon special offers and ads on the phone’s lock screen. Even though we shat on expensive premium phones earlier, if you’re the kind of person that uses their phone as their main gadget for getting work done, the Galaxy Note 8 is better than anything else. Not only do you have a massive 6.3-inch display offering more screen real estate than pretty much anything else out there, it’s also the only handset that comes with an included stylus, which is a huge boon for anyone who likes sketching or taking handwritten notes. And thanks to Samsung’s Knox security platform, Galaxy phones are often the only Android phones IT departments at big companies will allow. When it comes to the absolute best photos you can get from a phone, it’s really a three horse race between the Galaxy Note 8, the Pixel 2, and the iPhone X. Both the iPhone X and Galaxy Note 8 sport dual camera setups that offer a true 2x optical zooms and a plethora of fancy depth of field effects. On the other hand, the Pixel 2’s HDR processing finds ways to capture stunning shots that the other two can’t quite match. But when it comes to crowning an overall winner, between Portrait mode, Studio Lighting mode, slightly more detailed zoom photos and super strong color accuracy, the iPhone X is it. We still wish Apple would put a manual mode in the iPhone’s camera app though. Even though we’re mired in the battle between wired and wireless audio, there’s still one phone that makes music sound better than anything else out there: the LG V30. It doesn’t matter if you prefer old school classical ensembles or electro-charged synthwave hits, the LG V30’s 32-bit high fidelity Quad DAC has the power to let you hear notes that other handsets can’t recreate. On top of that, the Quad DAC lets you choose from several digital filters and sounds presets to best suit your ears. But the best part is that since the V30 is one of the few handsets still rocking a headphone jack, you can listen to music on the V30 using the cans you already own—no dongles needed. The one caveat to the V30 is that its bottom-firing mono speaker is just good, not great. So if you’re someone who cares about quality onboard speakers, you’re better off going with the astoundingly loud Razer Phone, or the BoomSound speakers on the HTC U11 or U11+. With a time of 16 hours and 13 minutes—almost a full five hours longer than its next closest competitor—the Asus ZenFone 4 Max easily had the best battery life we saw all year. Sadly, almost everything else about the phone is pretty mediocre, even for a $200 budget phone. The next three longest-lasting phones were the OnePlus 5T at 11:22, the Google Pixel 2 XL at 11:17, and the Huawei Mate 10 Pro at 11:13. But in an age where almost no phones phones still have removable batteries, if you really care about battery life, your best option might be to consider other factors first, and buy an external battery pack for when you need additional juice. But at least now you know what your options are. But wait, what about everything else? Yes, there’s a ton of other good phones from Google, Huawei and even Razer. But many of them have issues with their screen or camera that prevent them from being whole-hearted recommendations. There’s always next year.